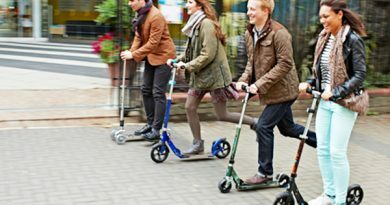 Scooters for adults? Why when there are so many other transport alternatives? Let’s think about commuting – whether to School or work can be a tedious, necessary evil and unless you can walk then you are either going to need to use your car, car share or use public transport. We all know, how tedious a commute is so why not save some money and add some enjoyment into your day? Bikes especially folding models like the Brompton are really popular and most major cities have now started to look at cycling as an integral part of the city infrastructure. More public transport is making space for bikes, folding and none folding varieties and cycle lanes are designed to make things easier. So why not buy a bike? What is all this scooter for adults nonsense? Walking is only effective if you have a short commute and the weather is on your side and cycling has its own challenges, mainly that in today’s world and on our busy roads, there is a real safety risk. No matter how conscientious a cycle rider is, you can never account for the blatant stupidity of other road users. 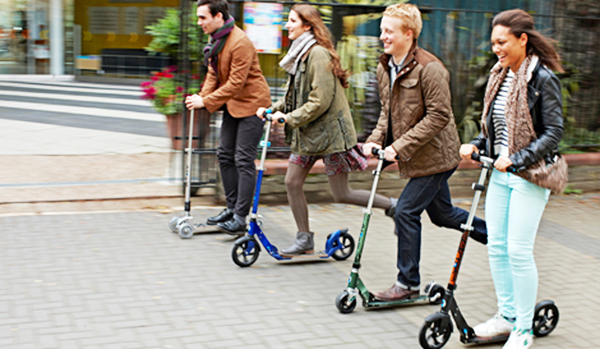 Research has shown that the best, safe and the most effective way of commuting in large cities is increasingly Adult Scooters. We are not talking about toys, these alternative modes of transport are increasingly being designed with the needs of adult riders firmly in mind. The best means of commuting in cities really is a scooter. As you’re reading this, it’s crossed your mind, or maybe you are open for something, ANYTHING that is an alternative to what you are doing now. The top tip we can share is to take some time, do some research and choose an adult scooter that is going to suit your personal needs. There are some terrific scooters for adults on the market and take some time to review adult scooters and choose the best for your needs. Seriously, it’s an important tip, ensure that you use the correct scooter. This is more than just size, adult versus children’s scooter, it can be all about the kind of types, yes or no to suspension, seat or no seat, electric scooter or kick scooter. Don’t worry, it’s not confusing and with the low entry costs of adult scooters compared to bicycles, you can actually buy more than one should you wish! Scooters are simple devices but they are increasingly well built to accommodate the needs of the adult commuter scooter. Yes, a scooter is a simple design, Handlebars, a deck and 2 (sometimes 3) wheels. Many are self-propelled (kick scooters) others are fitted with a lithium battery and are electric or electric assist scooters allowing your travel further afield. And that fact takes us onto the main core of this post, scooter versus bikes, is it a fair fight? So what could possibly be better and what reasons could we present to choose an adult scooter rather than a bicycle for you commute or travel to school? You might be surprised but there are actually a few reasons why you should consider an adult scooter over a bike. Bikes, even folding ones need space, space to store them at home and space to store them at the end of your commute. Scooters, even larger ones take up a lot less room, typically only one-third of the space of even the most compact folding cycle. (Public Transport)If you are commuting or part commuting (so to a public transport connection point) you’d probably need to leave your cycle in a bike rack. Or locked outside somewhere, there you are always at risk of opportunistic theft. 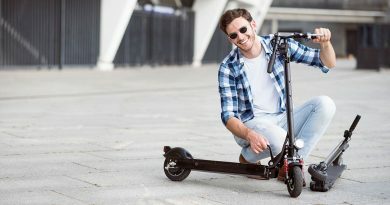 With an adult scooter, the vast majority fold, they are increasingly lightweight and you can just fold it and take it with you. At work it can store neatly under your desk, commuting only part way? Fine, fold and take it with you, simple. An adult scooter presents no travelling headaches. You can take bikes on buses and trains but there is always a little inconvenience. Are you in a bike friendly carriage, do you have a luggage slot to stow it? Even folding bikes are a little awkward to carry and manoeuvre and they are still reasonably heavy! Some scooters are very lightweight typically under 15 pounds and some new carbon fibre models are under 10 Ibs. Because of the lightweight aspect, it makes them very easy to carry. It is just a question of folding and carrying it to your destination. This is not the case with bicycles. Even foldable bicycles are still heavy making it difficult to carry. Scooters fold and are lightweight and a lot of them are now developing Trolley style rolling mechanisms – think suitcases, so they appeal to him and her. So, you are working and get offered a lift, but you have the bike, do you leave it at work? Decline the lift as you have your bike? No such problem with an adult scooter, fold it, take it with you, it’ll slot in the trunk with no hassle. Perhaps the greatest benefit when you look at scooters as a choice for adults to use is when you look at the safety aspects. You are scooting along and someone steps in front of you, or a car pulls out in front of you, you are suddenly in imminent danger. Just step off the scooter and danger averted. Many new adult scooters, as well as the rear friction brake, even have started to integrate handbrakes into their design. On a bike, you aIf you are in imminent danger of an accident with your scooter, you take measures to prevent it. This means that with scooters, you can sustain less or no injuries when compared to bicycles. On a bicycle. If you lose control of your bike, you are heading for a serious crash. It does not have control features and it is not as maneuverable as scooters. It’s unlikely the speed you are travelling will exceed that of a bicycle very often so you can avoid danger far easier plus, and this is a big plus, where bikes have to use roads (even cycle lanes) you are not restricted in that way with adult scooters, you can use them on the sidewalk. It may not be your riding at fault and other road users typically offer more danger than you, so being on a pavement is naturally safer for you on your commute! Check your local law, we are not a legal site and this is general advice so do check what the laws ate in your city or country when deciding where and how to use your bike or adult scooter. Municipal councils have laws in place that regulate the use of bikes in some cities. That may restrict where bikes can be ridden, (cycle lanes, restricted to some roads etc) and times they can be transported on public transport. This is rarely the case with adult scooters. There are rarely such regulations or legislations regulating scooter use. This does not mean that you should not be careful while using scooters. You have to take some safety measures, but you are not required by law to ride on roads or only use cycle lanes in most locations. Stick to the sidewalks and maximise your safety when you can! When you compare the bikes with Scooters in terms of their construction, you are going to discover that adult scooters do have an edge because of their low centre of gravity. This makes for greater riding stability, scooters, even beginner riders rarely wobble and a fall is low to the ground so injuries are minimised. Even if you are on the highest speed, the scooter is stable and this can minimize accident and allows for better control. In addition to that, scooters are fitted with good foot grip features. The tends to be a coating on the scooter deck so you feel more fixed to the scooter when in motion. If you look at folding bikes, you’ll see a few brands dominate the market, Adult scooters are growing in popularity and there are a lot of different kinds of scooters on the market today and many of them are manufactured with superior quality aluminium and magnesium materials so lightweight AND sturdy! You even choose some brands that offer a maximum rider weight in excess of two hundred and fifty pounds plus so it really is designed for almost any adult use. Check out our review for a range of scooters for adults. we cover electric scooters and adult kick scooters, choose your adult scooter now.